In her latest Scrapbooking tutorial, Katie shows you how recycling papers and covers for your scrapbook layouts is a good way of using up your paper scraps which would otherwise be thrown away. She has used a 9cm x 9cm photo for her layout. 1. I have used the Santoro’s Mirabelle 12” x 12” distressed grey paper and stamped the corner border stamp from the Curiosity stamp set on the top left and bottom right of the page. I also stamped two dragonfly stamps on the bottom left and top right of the page. To add some sparkle to my paper, I spritzed gold mister on the paper focusing on the top right, centre and bottom left of the paper. I have used the purple, red and turquoise DecoArt Acrylic Misters and flicked them across the page with a paint brush to add some colour. 2. Once the misters have dried, I have recycled the frame from the cover of the 12”x12” paper pad by cutting it out to size and then cutting it in half. I have then stuck one half towards the centre left of the paper and flipped the other frame and placed it in the bottom half of the paper slightly to the right. TIP: Save pretty packaging to use as free toppers and embellishments on your projects. 3. Cut a 21cm x 11.2cm rectangle and use the Dovecraft Decorative Stamp Scissors on the top and bottom edges to create a border. Stick the shape 2.9.cm from the left side of the paper using foam pads. 4. I have then cut the pink butterfly paper into an 11.5cm square and die cut it using the largest nesting die. Stick this to the centre of paper layout on top of the postage border paper. Layer your chosen 9cm x 9cm photo on top using foam pads to give the paper more dimension. 5. To add text to my layout, I have die cut ‘Lets Play’ using the First Edition Dies – Alphabet Varsity to fit in with the carousel image. 6. Paint a wooden heart and peg with the Everlasting DecoArt Americana Chalky Finish Paint. Once dry, I then added a coat of the Serene DecoArt Americana Paint and used a top coat of the First Edition Deco Maché Antique Crackle Top coat to create a aged effect. Once it is dry, glue the heart on top of the peg and add an adhesive blue pearl to the centre of the heart. 7. With a scrap piece of paper, cut a band to 7.7cm x 2.4cm using the deckle scissors and stick to the bottom left of the paper. With a piece of Mirabelle polka dot paper I have die cut a border using the Belle and Boo die set and layered on top. TIP: Don’t throw paper off cuts away, save them in a folder or box and use them instead of cutting small pieces off full sheets. 8. To decorate, I have looped grey twine several times and stuck it on top of the border die with glue. I have then added a floral accordion sticker to the right of the twine. To keep the twine in place I have gathered the twine and attached it under the accordion sticker using a mini black peg. 9. I have also decorated the top right corner of the paper by die cutting a tag and sticking it downwards. With a scrap piece of the rose glitter paper, I have cut it to 7.5cm x 2.7cm using the deckle scissors and layered on top of the tag die. To finish, I have added a small pink polka dot accordion sticker to the centre right of the rose paper. 10. As a finishing touch, I cut two pieces of the pink damask paper to 4cm x 1.9cm and cut a fishtail design to one side. Tuck a fishtail tag under the grey and pink butterfly papers on the top left and another on the bottom right of the die cut paper. Have you been inspired by Katie’s How to Scrapbook tutorials? What items do you love to recycle to use of your craft projects? 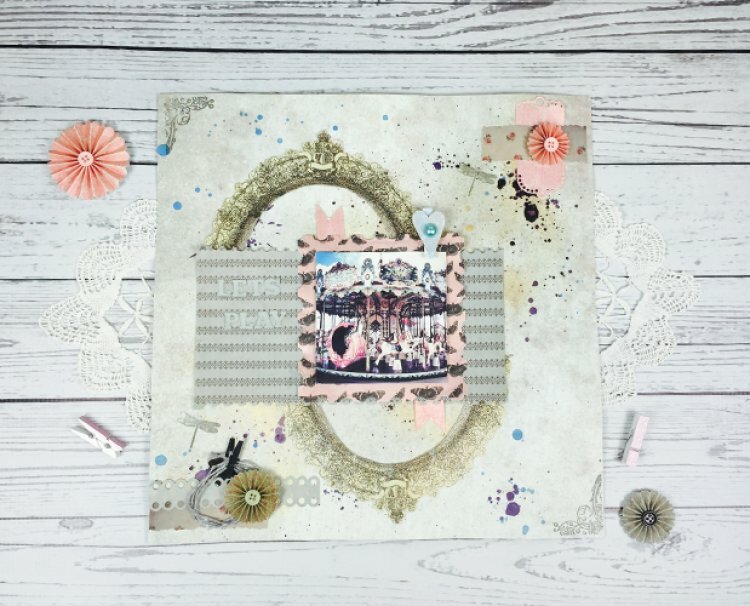 We would love to see your scrapbooking layouts in the project gallery.